If you bought your truck with the factory keyfobs and you're like me, you keep your original keyfobs in a working condition. But... out of seven Land Rovers I ever owned, only two had working remotes. That leaves several relying on old trusty door keys to keep the riffraff out and legitimate occupants in. 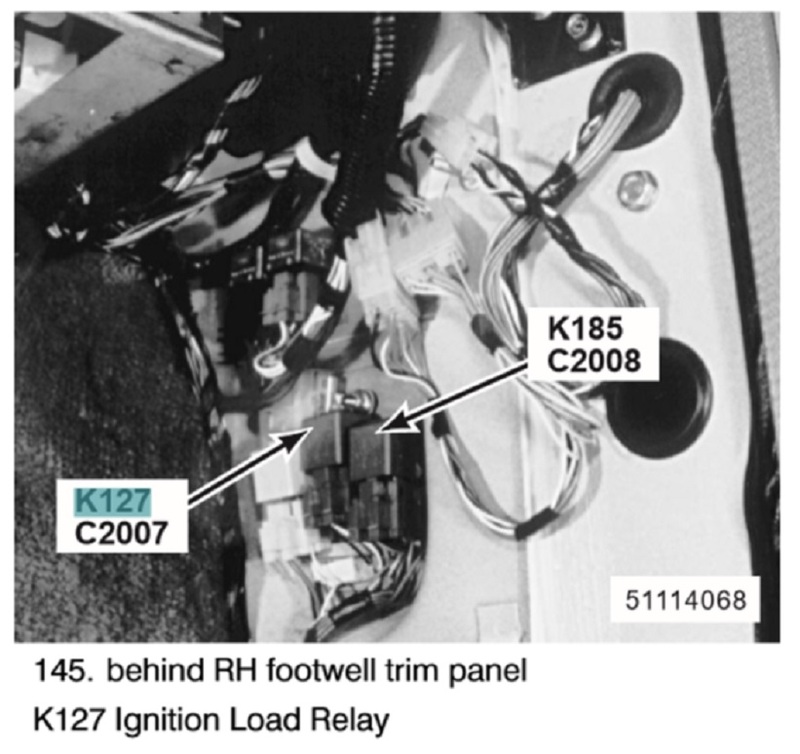 The designers of RRC and D1 used a lot of parts that leave you wondering - were these parts meant to be expendable (like a "fuse" in the driveline) or these were bean-counter solutions? One of these, in case you didn't know, is the U.S. quarter-sized plastic piece that moves the Rube Goldberg machinery inside the doors. Said machinery typically receives zero love and attention, and is left to its own to aggregate lube and fine dust into a good semblance of asphalt. You may have noticed that the locks become progressively harder to work with the key, and the keys acquire some spiral-ness to them. At some point, the quarter-sized piece of plastic lets go, and you are on the side of the road with key freely spinning in the lock, and pondering your options and past life choices. 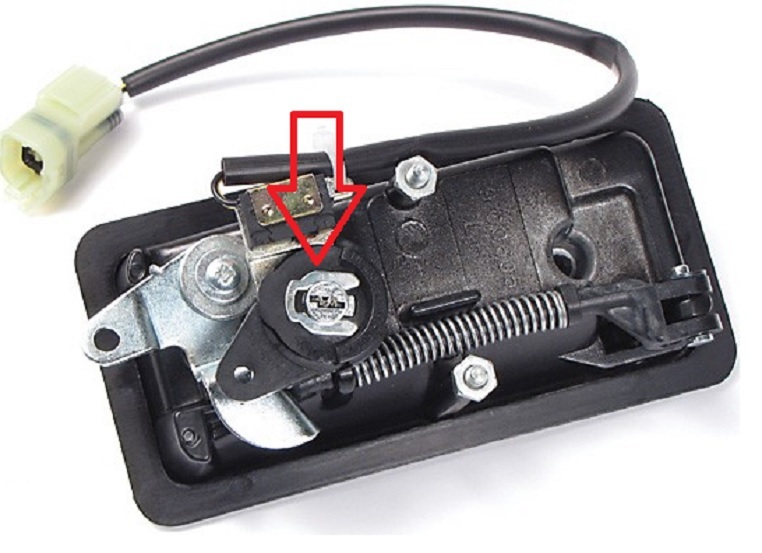 The picture below (stolen from the Internet) shows the offending part in the back of the outside door handle assembly - the tip of the red arrow rests on that black disk. To get the obvious question out of the way, the black plastic disk comes together with another cheap plastic part that actually moves the machinery inside the door. The two together are known as part number STC 1220 (for the left side) and STC 1219 (for the right side). The sides are not interchangeable. There's a saving grace for the Classic owners - the passenger-side lock is often much less used, and the plastic piece likely cracked but not yet broken. So all you have to do is keep unlocking the passenger door until that one dies, too. The Disco 1 owners are less fortunate - meaning the bean-counter savings of about $0.1/vehicle on a slightly cheaper version of the door lock and wiring. You can unlock the truck from the passenger side, and be greeted with alarm going off and waking up the whole neighborhood. You will then dive into the truck, slam the door behind you, and reach over to the driver side button to lock and unlock it. A sign of a good D1 owner is being able to execute it in less than three horn sounds - however by the time you master this skill, the little plastic wheel in the STC1219 will be gone, too. Don't worry though, you still have rear door or tailgate to ruin. So, after many purchases of said parts, I saw the writing on the wall for my latest 95 LWB. This is a result of a few occasional glances at the Rave Electrical Troubleshooting Manual for a NAS 1995 Range Rover Classic and NAS 1996 Discovery. The idea was to have a minimally-invasive bypass for the factory keyfobs - and keyfobs only, because the factory theft alarm box is retained in nearly all its functionality. 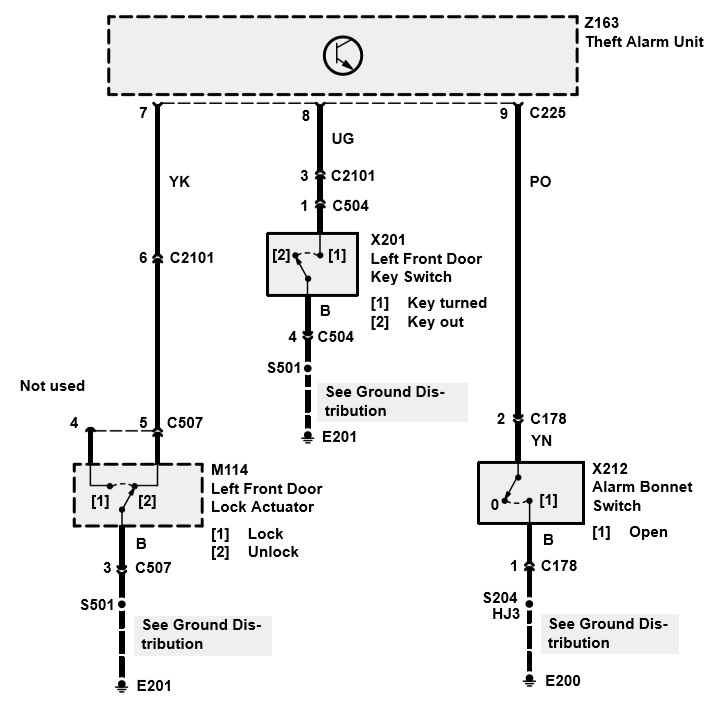 The schmucks who forced their entry into Land Rover world by buying nearly twice-cheaper Discovery are only given one front door actuator with a switch, so don't even bother digging into the other door. 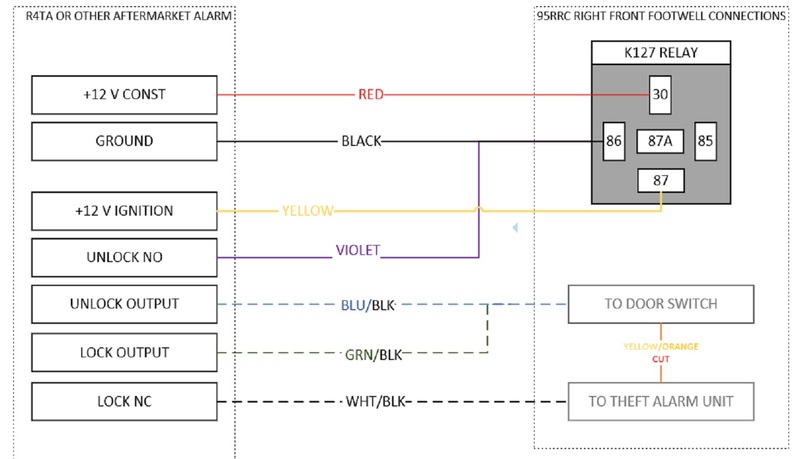 (a) when the doors are locked, the yellow/orange wires going to Theft Alarm Unit are NOT connected to the ground. For your information, Theft Alarm Unit provides a voltage of about +1.6V on these lines when the door switches are open. 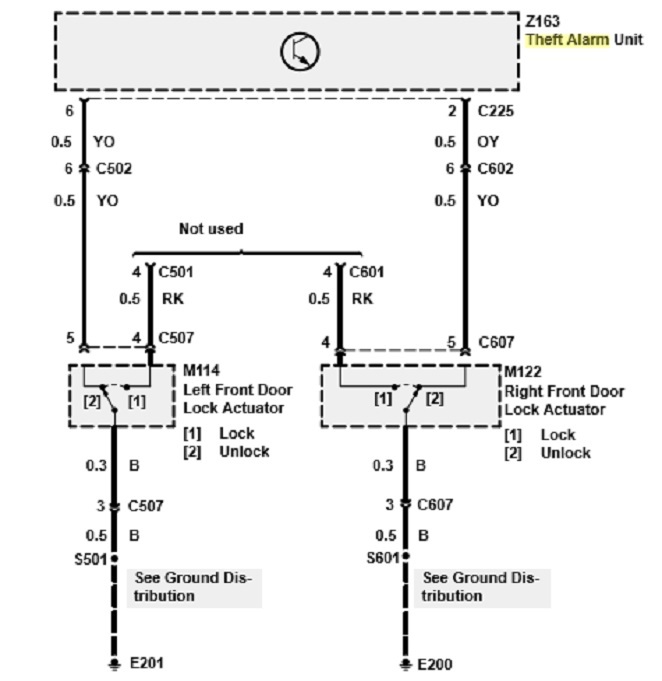 - To unlock the door (and the rest of the doors), one has to connect the yellow/orange wire to the ground. (b) when a door is unlocked, the corresponding yellow/orange wire is shorted to the ground. - To lock the door (and the rest of the doors), one has to disconnect the yellow/orange wire to the ground. The wire color listed is for a NAS 1995 RRC; it is yellow/black for a NAS 1996 Discovery. This is all you have to do to avoid wearing out the keys and the plastic pieces the keys move. Now you need a remote / keyless entry / whatever unit - controller with keyfobs. Enter a perennial classic - I don't think anything changed in the design or operation of this box since the first time I used it about 20 years ago (under a name "Black Widow"): 4RTA. EBay sells it with a couple of extras for $24.99 (https://www.ebay.com/i/183249864355?chn=ps). The marketspace is flooded with countless clones of the same circuit, and only the number of controlled circuits and buttons on the remotes change. At the moment, we only care for the remote door lock operation, so I will leave the most other niceties out. (a) A pair of normally-closed (NC) contacts that are opened with the action of remote, to LOCK the doors. (b) A pair of normally-open (NO) contacts that are closed with the action of remote, to UNLOCK the doors. 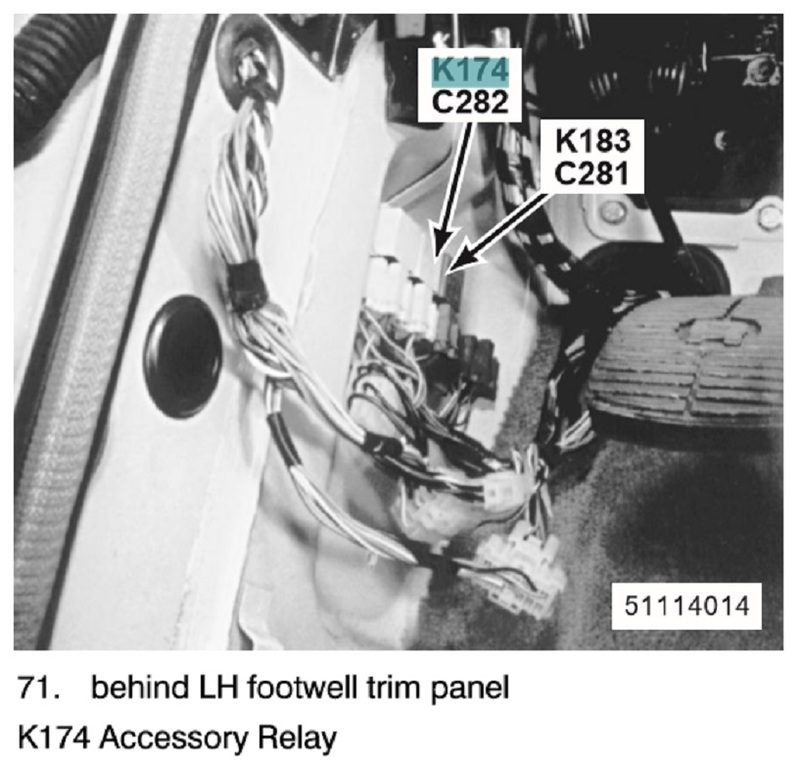 The following two pictures are quasi-circuit diagrams showing the connections of the keyless entry controller to the Range Rover Classic's wiring; the beauty of this is in minimal intrusion into the vehicle's electrical system: one single wire cut. The other modifications to the vehicle's electrical system is tapping into a permanent +12V feed, an ignition-switched +12V feed (not really necessary), and ground. The RRC and D1 are so choke-fed with relays that one can find all needed circuits pretty much anywhere. 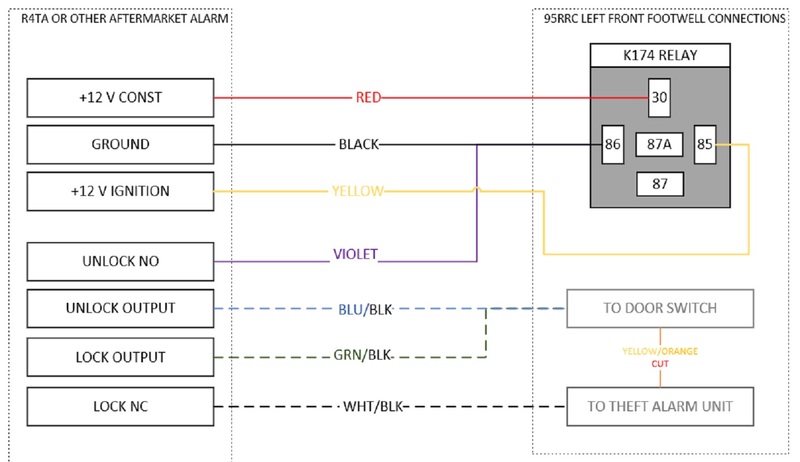 (b) Wire colors are shown specific to whatever flavor of aftermarket keyless entry controller you have. What matters are the connections to the different circuits / outputs of the controller. After I have installed my keyless entry controller in a non-disclosed location and connected it to the vehicle's electrical circuits in one of two shown ways, I hit a button on the keyfob and ... nothing happened. The battery in the remote was dead as a doornail. They take these little 12V batteries that no one in his right mind keeps at home - so I stole one from a twin-brother of the remote I used for the old jeep. Then I hit the lock button... the door locks slammed in unison... and un-slammed back to open in a couple of seconds. The reason was the tar-covered Rube Goldberg contraption in the driver's door, complete with the broken plastic ring. It took about half an hour to take the door apart, replace the ring and plastic lever with contents of a bag labelled STC1220, clean and lubricate every visible joint of the lock linkages, and put everything back together. The key works in the driver's door. The key works in the passenger door. The keyfob locks and unlocks the doors. Life is amazing. The only annoyance I've come across is that the keyless entry gizmo would lock the doors a few seconds after the ignition is turned on. Maybe that yellow wire to ignition-switched +12V can be safely cut.